Should the federal government make life more difficult for low-skilled workers? Heck, most people understandably will think you’re crazy for even asking such a preposterous question. But some of those people will also think that it’s a good idea for politicians in Washington to make low-skilled workers less attractive to employers by raising the minimum wage. I often ask such people whether they are more likely to buy a Big Mac if McDonald’s raises the price by 24 percent. They say they are less likely. I then ask them if they are more likely to buy a car if GM increases the price of a Buick by 24 percent. They say less likely, of course. But they seem to have a blind spot when I ask them whether employers will be more likely or less likely to hire low-skilled workers when the government increases the cost of those workers by 24 percent. I explain further in this interview for Yahoo! Finance. The interviewer, by the way, seems to be economically illiterate. He apparently believes that we can reduce inequality by pricing poor people out of the job market. He also blames companies for sitting on piles of cash, presumably unaware that firms only will invest if there are profitable opportunities. Ultimately, I try to help him understand by comparing fast-growing economies such Hong Kong and Singapore, which have relatively low burdens of government, with slow-growth economies such as France and Italy, where politicians ostensibly seek to “help” people with various forms of intervention. I’m not sure I made any progress, so feel free to suggest other ways of convincing skeptics that freedom is better than statism. Anyway, for those who want more information, this video explains the underlying economics of the minimum wage. We also have plenty of evidence (see here and here) that unemployment rose following the most recent hike in the minimum wage. The people that you believe cannot generate more than 8.00 per hour in production could easily move it up. If you are only getting 8 why produce 10 or 15., why care when you can just go get another loser job. We are already seeing a lack of labor on the bottom end..why?? because you cannot survive on 8 or 9 therefore it is pointless to work for that. I spent years dealing with that kind of attitude. According to your theory it would drive wages up…but thats exactly what you do NOT want? Your the sky is going to fall if you do that is nothing more than a scare tactic. YOu have convinced yourselves that it will make it worse because you want it to be that way. If it was not mandated there would be people working fulltime and living in cardboard boxes at 4.00 per hour. They wouldnt have transportation….would not bathe regularly…no running water in a cardboard box…..then would lose their jobs….the welfare rolls would go through the roof and you would still claim that no minimum is a better idea…lol. Now I understand that that is an extreme example but a similar thing would happen. Your businesses will suffer, crime will increase, welfare rolls will hit an all time high, there would be no winner there. I will never believe that taking unfair advantage of people makes the world a better place…. on August 26, 2016 at 10:56 am Is Anybody Shocked that Higher Minimum Wage Mandates Are Resulting in Fewer Jobs? It always frustrates me that the main argument for minimum wage, i.e. that it needs to be a “livable wage”, is not more often challenged for the specious foolishness that it is. Starter jobs and minimum wage jobs have traditionally been designed to allow the “unskilled” worker to obtain some basic job skills and good work habits, such as discipline in adhering to regular working hours, responsibility to perform well, learning to interact with people, both clients and supervisors, and starting to learn to manage their own money, not to mention the appreciation of the value of earning your way in life. 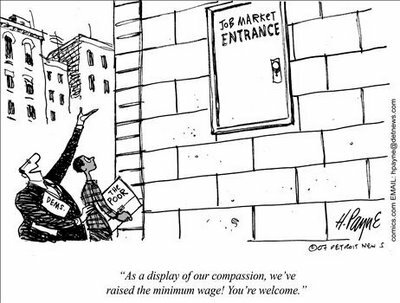 Never was minimum wage designed to support a person for life. In fact, the vast majority of minimum wage jobs are geared toward young people, just starting out in their careers, who, for the most part, are still supported by their parents. I know that someone is going to say that not everyone has parents to fall back on, but my answer to that is that, although true, this is a serious social issue that goes directly to our society’s disintegration of the family support structure, and needs to be dealt with completely separately. It does not in any way diminish my contention that the issue of the minimum wage is being used as a re-distributive tool by “nanny state” leftists. While making it near impossible for the few young people actually making the effort to find a starter job, by moving the entry to the job market that much more difficult, it gives just another added excuse to entertain alternative life choices, including gangs, crime, and sponging off their relatives and friends. By artificially raising the minimum wage, besides all the reasons already mentioned in the above comments, we would be minimizing a person’s incentive to strive for better, thereby resulting in a complacent and lazy workforce without the ambition to achieve anything of value in life. We already have far too many “freeloaders” on the taxpayers’ backs. Let’s not be coerced into providing yet another incentive for them to continue leeching off of the system. The interviewer glibly says, “the extremes at either end don’t work…” while the “extreme” at the freedom end really hasn’t even been tried yet. He was just dripping with the politics of envy and the “blame the rich nasty corporations” meme, and I noticed that when Dan tried to remind him that it’s the Cronies that make the big bux and screw their employees and have Da Gubment screw the competition, the guy listened about as well as Piers Morgan listened to the evidence that the mass shootings all happened inside gun-free zones. “Share the wealth.” Feh. When are their rich socialistic union bosses and the likes of Soros and the millionaire Hollywood fat cats like that pig Michael Moore going to share _their_ wealth? …which [giving precedence to equality over prosperity] would be an individually oppressive but valid aspiration, until you realize the utilitarian aspect. That under slower growth rates the year we finally defeat cancer gets perhaps pushed from year 2060 to 2080 and realize how many lives are under that slower evolution integral. And that is just one aspect. Same for the year we discover true alternative energy, climate control, manipulation of the genetic code that makes us age …etc… use your imagination… or better yet let seven billion humans use their *total* intelligence (*total* not their *average* intelligence, that is what happens at the polls under democratic socialism). As a matter of fact, had human tendency towards collectivism allowed a mere 0.2% additional yearly growth in the past millennium, we, as humans, would now be seven times richer and would probably already be living in a world without cancer and bioengineering technology that had already boosted our life expectancy by several decades, or we may have cracked the aging mechanism itself to some extent or another — not to mention that the year we stopped burning witches would have been expedited by two centuries. An additional two percent annual growth in the last century would have had the same effect. If the world growth rate of the past two decades had extended the entire century, we would be seven times richer, probably live in a world without cancer and life expectancies well beyond what we consider lucky today. That is the true price of collectivism, slow growth, equality of outcome. But lemmings are oblivious to the simple arithmetic of compounding growth, so they will assert their de-facto majoritarian birthright to a worldwide top 15% unearned prosperity level. Simply because they were born in America. Worldwide fairness in their mind, I guess. So the lemmings will keep on hoping. They will keep hoping that I will work more than twenty hours a week, so that I can leave my family and leisure every morning to be taxed at a marginal tax rate of fifty percent, only to bump my assets into inheritance tax territory and pay another forty-five percent on the back end. They will keep hoping that I give them work by re-activating the half dozen projects I left dormant when I switched to part time work. Projects that were difficult to engage in the first place because the people competent enough to work on them are already employed to even more important activities (and also earning more money than I could pay them and remain profitable). Watch how in 2014 I go down to a 5 hr work week and stick them with my ObamaCare bill. That is when they’ll realize that the bumper sticker with the big O they have on their car is just a preview of their rear end under European socialism. Realize? Slap me! I’m fantasizing again! The European experience demonstrates that lemmings on the run don’t realize such things. They will probably keep hoping that they can go grab someone from the unemployment line to restart my abandoned projects. But what I’m complaining about. I live in the brief golden-smorgasbord period. This is when the American People discovered the cookie jar where two centuries of — aberrant by world standards — notorious capitalist selfishness had accumulated American prosperity. And we’re about to break it and enjoy it. Seems like I emigrated to this country just in time folks! Now, I may just get by. My children? That is a different story. They are probably on an estate planning pathway to dropping their US citizenship. So my advice stands: Keep mobile. Experience shows that you cannot reason or subdue the pitchforks, their collectivist slogans, hopes, and songs. Better redouble your efforts. Perhaps the rich are not quite as dumb. Rich? I’m not rich, not even by Obama’s 200k definition, at least not at 20 hrs per week work — and poised for lower! I can’t remember where I heard this point, but it is valuable to understand that the actual minimum wage is zero. Unless we either have the government hire or start forcing businesses to hire people, there is no obligation on the part of any business to pay anyone anything. I suppose some would see no problem with hire-at-gunpoint policies, but I can’t imagine that the majority of the population sees this as viable or fair. The problem with this concept of “forcing” people to make economic decisions (hiring, seeing patients, buying health insurance, etc.) is that it is a direct assault on individual liberty. I am not doubt preaching to the choir here, but the free market, libertarian alternative to these policies are certainly more attractive to me and also jibe much better with the classic (read “correct”) interpretation of the Constitution. Large one-size-fits-all, guaranteed-results, picking-winners-and-losers approach of the current set of chowderheads we have in office is destined to make everyone equally miserable, not solve the original problems and waste effort and time. I believe it was Dennis Prager who said “The left is not interested in prosperity, it is interested in equality.” It’s more concerned with making sure everyone is treated the same than seeing the economy or society excel. They’d be happier with EVERYONE making $10/hr than to have the average wage be $20/hr with some making more and some making less. The US currently has the highest average income (http://en.wikipedia.org/wiki/List_of_countries_by_average_wage), but apparently that doesn’t matter because some people make less than that. …and since they [the 99%] are advocating policies that will preserve a western world (- 3%) annual growth deficit to the rest of the world, the rest of the world will soon catch up and then they will experience what its like to be in the true worldwide 50%. Yes, that HopNChange will be quite a change indeed. Seriously dude, I love it. These “99%ers” are such useful idiots! Hi Dan, re: “firms only will invest if there are profitable opportunities”. That’s very true, but worth adding that this is because IT’S NOT THEIR MONEY!! Their capital / piles of loot / whatever, belongs to shareholders who have put that money at risk in order to get a better return, & the “companies” have a fiduciary obligation to those shareholders to do just that> He’s a moron. Yahoo is statist/collectivist? Oh my! Who would have thought…. Don’t you know? The increased salaries will be paid from trimming the pay of twenty executives at each company — which executives apparently earn their pay in a non-competitive environment – and shareholders of all stripes (retirees, 401Ks, people who save) who will now accept even lower returns on their investments but will somehow continue to save — ie. engage in deferred compensation to finance the starting of new business activity. I mean what else are they going to do? Move their assets to other investment vehicles or even overseas? Don’t worry. Legislated lower effort-reward curves will work in the end. People are either ignorant or have no place to run to, no other non-pecuniary alternative activities to enjoy… they are trapped! They will work and pay! The total lifetime productivity of the American middle class is loosing its top spot in the world — as a result of the flatter effort-reward curves that come part and parcel with convergence to a near-ubiquitous welfare state norm, where exceptionalism is increasingly plucked to shield the voting majority from the consequences of mediocrity. So the American middle class thinks it can retain, or claw back, its top fifteen percent prosperity status in the world through redistribution, i.e. through further flattening of the effort-reward curves. It’s the classic delusional voter-lemming run to decline. Stay mobile. It is impossible to reason with the pitchforks. Those who describe themselves as the bottom 99% but are really the top 15% on a worldwide basis. Great post as always. You remind me so much of Milton Friedman but taller. The problem is you are skipping economic stones across a shallow pool of knowledge. Your interlocutor doesn’t understand the structural difference between France and Italy and Singapore and Hong Kong, so those points leave no mark. Your task was more basic. What is the definition of the price of something? Answer: what someone else is willing to pay for it. The government is distorting the market value (price) of unskilled labor and this distortion will be felt across the market place. This is why socialism always fails, because people want price to be something that it is not. The other side of the argument becomes what happens when unskilled labor cannot self itself well enough to fund its own existence? And here we are off to the races in trying to find the balance between exploitation and profit. That debate is too big for a sound bite or a blog response. That is the debate that is worth having. Kudos on keeping cool in the face of ignorance. People should be required to take a personal finance class and an economics class before they can register to vote. Price floors create surplusses – end of story. Well done. But raising the minimum wage makes people feel good and that’s what really matters. Voter-lemmings and liberals are too busy to be concerned with any hard evidence. Ditto for gun control legislation that never works, campaign finance reforms that don’t work, etc. Of course, we’re less free after these legislative “fixes” are applied.